What a show we have for you! Just in time for the beginning of 2016 and a new tax year. 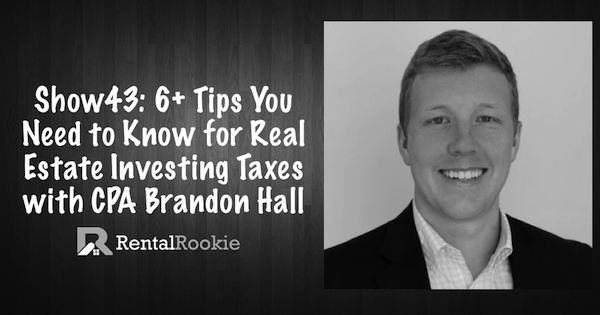 We have CPA and real estate investor Brandon Hall on the show to share with you some tax tips and his own experience thus far in real estate investing. As a CPA, Brandon has worked for Big 4 firms, but has chosen to focus on the real estate industry. He helps real estate investors who are looking for a tax consultant to help them manage and run their business efficiently from the tax side. His in-depth knowledge consists of accounting, tax planning, entity structuring, financial modeling and valuation services. He is a contributing writer for BiggerPockets, where he shares articles for other real estate investors. Today, he shares with us some awesome information. In interviewing him along, Kirk and I learned so much more than we already knew about effective tax planning for our real estate business. This is a 'not miss' show that everyone who is investing or who is going to start investing needs to listen to.